With Mikrotik HotspotSystem in place, expect from security and bandwidth management and sharing, one of the basic targeted aim is that all Users connected or connecting to the network must Login first in order to access the internet. In most organizations, sometimes there are top managers or some users who are lazy to log in and want to be able to directly enter Hotspot without login or wants to automatically Bypass Login Hotspot Mikrotik without authentications. 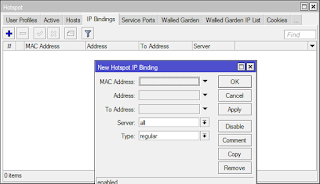 For us to accommodate these user requests, we can take advantage of Hotspot IP-Bindings configuration feature. 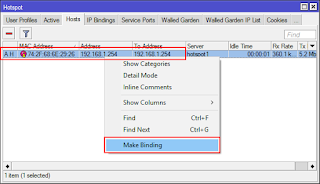 The mikrotik IP Bindings features allows us as admin to bypass certain user hotspots without having to go through the authentication process (login). 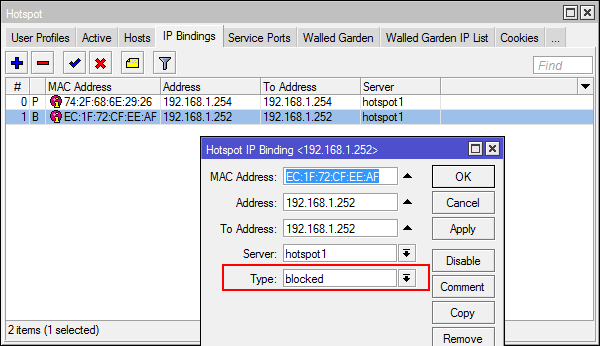 Furthermore, IP Binding also allows us as admin to block and limit certain user’s access the hotspot network. 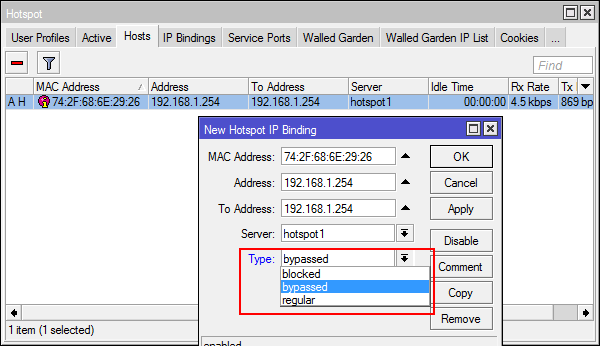 This Mikrotik Tutorial, is simply designed for us to in discuss in detail on How to help bypass certain hotspot users so that they will not need to log in as well as how to block a user access to Mikrotik Hotspot using IP Bindings. First you will have to Make sure that Mikrotik Hotspot is running well with the user connected. 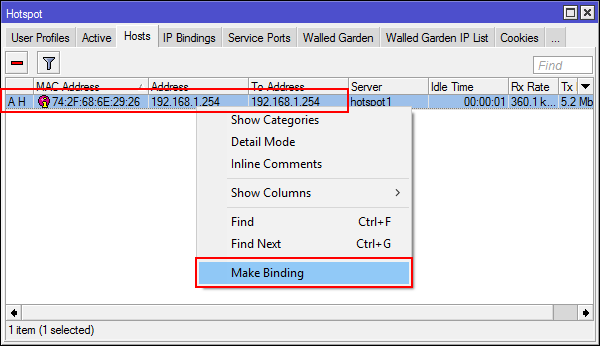 Open Winbox, Go to IP menu -> Hotspot -> Log Tab Bindings -> Add new IP Binding. 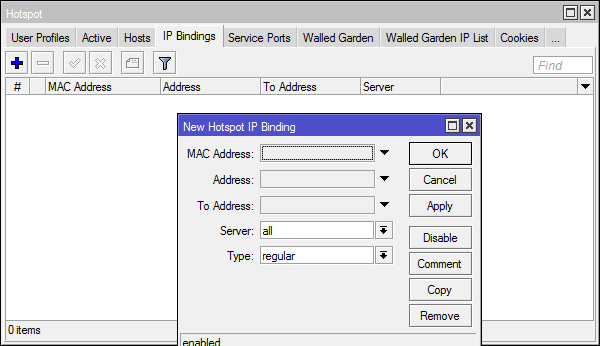 Make sure to detect the MAC Address and IP Addressof the user then enter the details in the fields provided. If you find the above process stressing doing, then do worry about manually entering the MAC and IP Address of the User, simply click on the Host Tab -> Make sure Users who want to bypass already connect to WiFi Hotspot -> Right click on the user in question on the list -> Make Binding. This will make the IP Binding data filled automatically. On bypassed -> Select OK.
Once you have done this ask the user to logout and login again, to connect again to WiFi Hotspot. 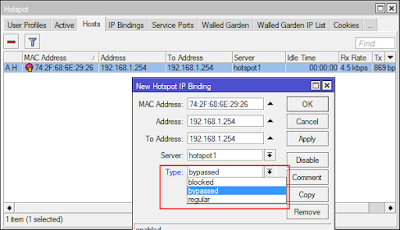 He/she should no longer be directed to the login page Hotspot Mikrotik, but already able to access the internet directly without the need to login hotspot. 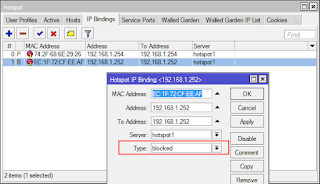 How to Deny Users on Hotspot Mikrotik Not to gain access to Hotspot internet. The configuration is just the same as the one we did above, just that in IP Binding column data Type select blocked. Thus the blocked user can still connect to WiFi but cannot access anywhere. Cannot even access Mikrotik Hotspot Login Page. Users will think that his hotspot is problematic or his internet is not working, even though he is the only access we are blocking, guess that is a good trick to kick unwanted personal out of our network. So in general this is how we go about Denying Users on Hotspot Mikrotik not to gain access toHotspot internet and also How To Bypass Login authentications for some users in Mikrotik Hotspot. If you have any problem doing the above please make sure to fill the form below or contact us on our contact page we will be happy to help you work through it. ← How To Configure And Manage Your Mikrotik Routers Using Android Devices via SSH.